are you Here, or are you Lost? 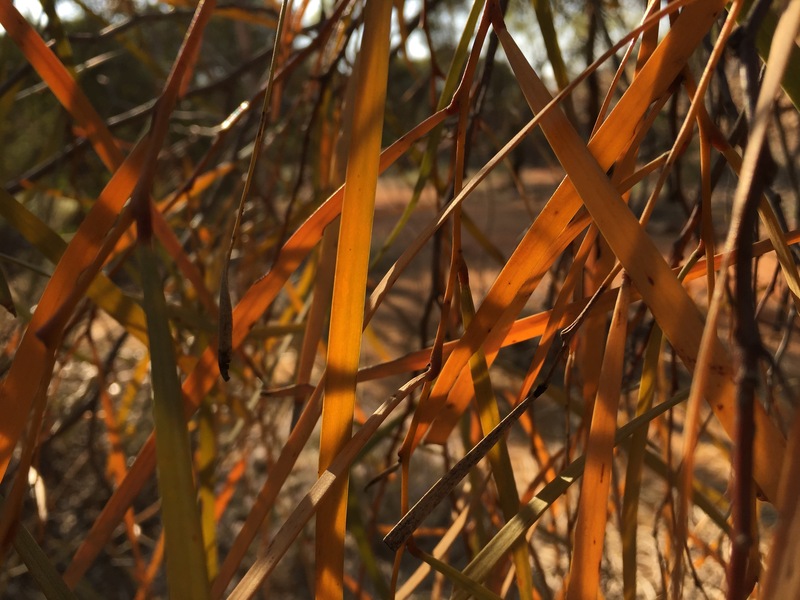 In my 365 Photographic Challenge, I have renewed my love of Alice Springs, Australia and nature– especially for trees. Reading David Wagoner’s poem, I think I know why. It has helped me know where I am. Eucalyptus trees lining dry Todd River bed. bark layers of a ‘Paper Bark’ tree. Eucalyptus trees, with Corkwood tree blossom in foreground. Looking longingly at all these beautiful images, I am also ‘there’ and for a few moments not ‘here’. You have inspired me to go wandering at the magic hours of dawn and dusk. Although all so beautiful, I love the one of the Corkwood tree at early sunrise. Are you still using your phone to capture these moments? You are most fortunate to be Here, and there, in both senses. In return you are generous in the inspiration you share. To me, that’s grace. “You can become blind by seeing each day as a similar one. on my About page. It opened my eyes to the miracle. Courtesy of the #snapsydney Instagram event yesterday I opportunistically persuaded the G.O. to join Instagram (telling him I couldn’t publish his pics via my account). He enjoys your photos, and has a good eye. I’m hoping it will reconnect him to Here and the miracle of each day. Thanks so much Dale. Lovely quotation Coelho has brought into consciousness, and you in turn shared. I’ve just been writing an upcoming post with some similar ideas in it. So happy to hear the G.O. has joined Instagram. Only today a friend was saying to me how important it is for a photographer to have a ‘good eye’. I wonder if it is something one can learn or if you’ve either got it or you don’t? Send me the G.O.’s Instagram name in the private messages box–I’d like to follow him. Thank you. That’s lovely… he’s just followed you. Let me know if you don’t see it. Some staggering shots Dale, especially in your treatment of them. I’m thinking of No. 6 looking at the cliff top.They’d look fantastic on any wall. Thank you Roger, much appreciated. Stunning photos, Ardys. I often photograph trees, though I rarely post about them. They’re such a solitary life form… even in forrests and woodlands, and so majestic. I am amazed that your images are from an iPhone! I used mine recently and the images were a complete flop! I know it is because I have rarely used the iPhone. Most of the time I use my DSLR and zoom. Your work is impressive! Thanks so much Lori. I’ll give you a little iPhone tip…don’t ever use the zoom feature. You will get better results by taking a regular shot and then cropping it later. The zoom feature randomly edits out pixels across the entire frame, whereas if you crop it yourself, you are only deleting pixels you don’t want. Having said that, it is just not a good camera for shooting wildlife, so don’t even bother with it unless the wildlife is sitting in your lap! You’ll notice I have very few animal photos and the ones I do have were pure luck! All those wonderful trees – I never associated trees with Alice Springs! Most of the trees are from here, but a few are from our travels in SA. Thanks Sara.